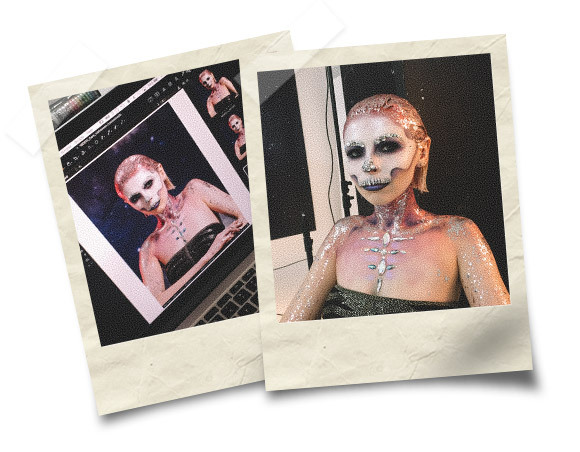 Hannah Kettle, Group Art Editor for AS Watson, tells us how crystals, galactic themed wallpaper and lots of glitter made for the perfect Halloween shoot on a scorching-hot summer’s day. For the third year running, the DARE team at River produced the Halloween creative for Superdrug, which is now in their stores nationwide and across multiple channels, promoting one of their biggest seasonal campaigns. On a boiling-hot day in June, four models, two makeup artists, two hairstylists, one photographer, one stylist and myself – accompanied by a lot of Maltesers – created four iconic looks ready to own Halloween 2018. First up was the Crystal Skull, a deathly white skin coupled with purple eyes, lips and shading, and embellished with crystals and glitter to highlight the spooky bone structure. The model Abbie was gradually transformed over the course of a few hours, while the photographer Lancton and I set to work on dressing the set. 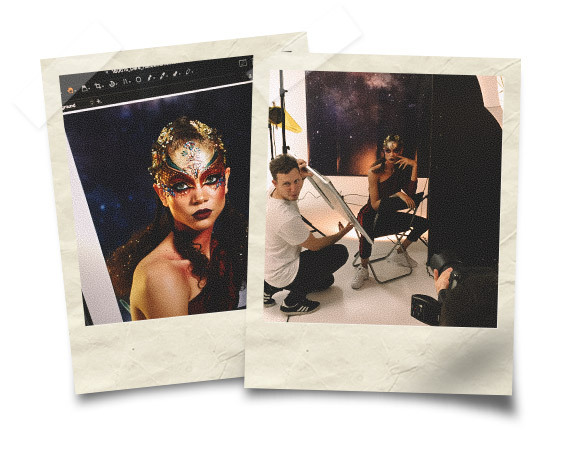 I’d spent several days trying to find the perfect background, sourcing wallpaper that went with the rest of Superdrug’s galactic theme for their Halloween campaign. Lancton experimented with lighting and colour until we were able to get Abbie on set to do test shots. Once set up, it took us about half an hour to nail the look for the first shot, and then we got going. 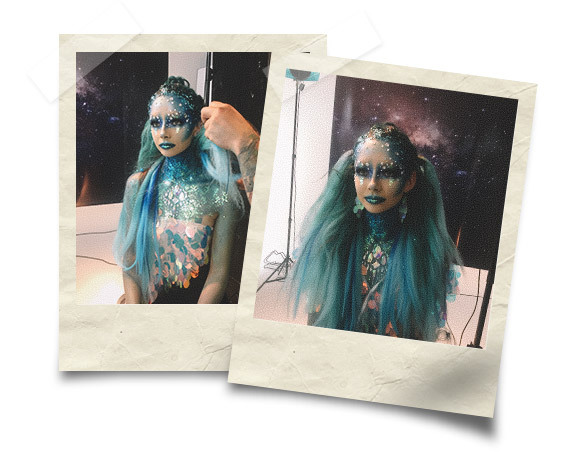 Next up was Superdrug’s hero look for the campaign: Enchanted Mermaid. Our model, Georgia, was perfect for the look. 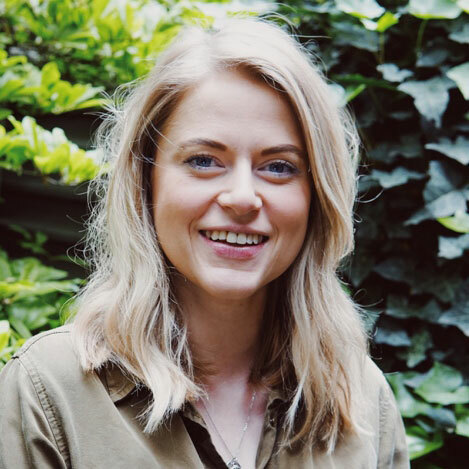 I caught a glimpse of her sitting in front of the mirror surrounded by the entire stylist team transforming her, while Steph, the nail technician, added the finishing touches – pearls on the tips of her nails for that all-important underwater feel. Covered in glitter, pearls and gems, she shimmied on set and instantly wowed us with her mesmerising energy. The amazing hairstyle for this look was created as part of a commercial partnership with Unilever, so getting the brand’s input was key. It was also important that the styles were achievable for the readers to recreate at home with Unilever products. Georgia’s long (now green and glittery) hair didn’t disappoint! While our mermaid was on set, one of the makeup artists started work on Nicole, our Bejewelled Dragon. 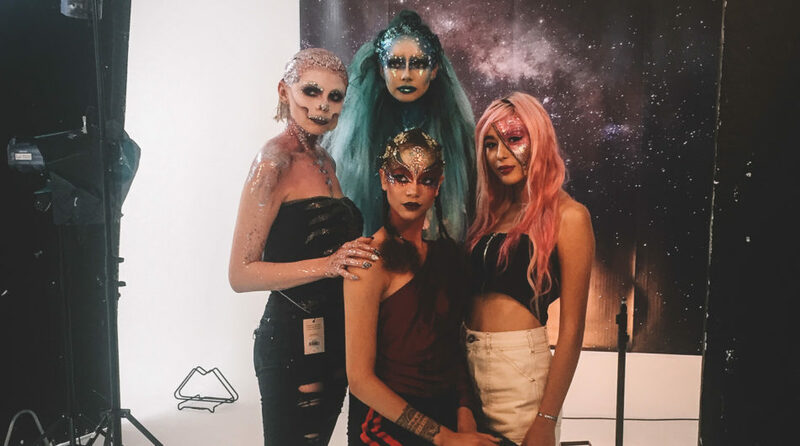 The makeup and hair for each look took about an hour and a half to achieve, so time was of the essence, and we had to manage every second effectively. The last look of the day was our Glitter Zip. With half her face covered in mega-glitter, the model Sabrina looked spooky yet glamorous. She was a complete natural and performed perfect pose after perfect pose, making the end of the day completely stress-free. We managed to wrap on time, which was quite an achievement for four extremely detailed Halloween looks and the result of a lot of pre-planning! Now the campaign is live, it’s great seeing the stunning fight-night looks in stores and across all of the Superdrug digital channels, especially remembering how we created them on that extremely hot day in June.